Young Marie wants to be a ballerina, but her parents have no money for lessons. She must earn what little money she can as an artist’s model at a ballet school. Then, her life takes an unusual turn when she models for the famous sculptor, Edgar Degas. 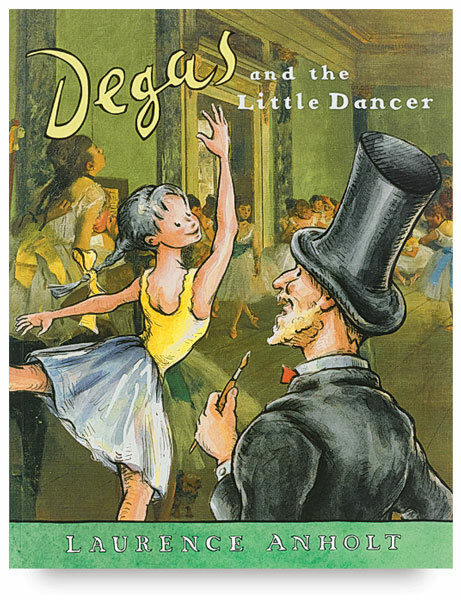 Degas the the Little Dancer is from the Anholt’s Artists Books for Children series, in which author and illustrator Laurence Anholt recalls memorable and sometimes amusing moments when the lives of the artists were touched by children. Anholt’s fine illustrations appear on every page and the book includes reproductions of works by master artists. Laurence Anholt is a British writer and illustrator whose books for children include Van Gogh and the Sunflowers, Cézanne and the Apple Boy, Leonardo and the Flying Boy, and Picasso and the Girl with a Ponytail. Anholt’s popular books for children have been published in 15 different languages, including Cantonese, Hebrew, and Icelandic. As both an author and an accomplished illustrator, he has created a charming series of children’s stories about famous artists. He and his wife, Catherine, both successful authors of juvenile titles, have three children, from whom they obtain many of their story ideas. They live and work in Lyme Regis, Dorset, England.